Born in 1947 in Baton Rouge, Louisiana, Rafael studied Fine Arts in Canada, the United States and Venezuela. His artistic trajectory dates back to a very early age. He took drawing and painting at the Museo de Bellas Artes in Caracas, Venezuela, achieving his first recognition with the award “National Youth Painting” in 1963. Upon completing his basic studies in Venezuela and Canada, he received a scholarship from J. Walter Thompson International to attend the Ontario College of Art in Toronto, Canada, graduating with honours in “Pure Art” and “Communication and Design”. He received a scholarship from New York University (US) to attend its Graduate Program for “Fine Arts” and “Monumental Sculpture Techniques”. He was granted several national and international awards: “The Sculpture Award”, Ernesto Avellán Exhibition; the McLean Foundation Scholarship, the highest award offered by the Ontario College of Art, Canada; the “Excelentísima Diputado Provincial de la Frontera” Decoration, for his Monumental Sculpture titled “Tercer Horizonte”, to commemorate 500 years of the discovery of America, located in Palos de la Frontera, Huelva, Spain; “Second Prize” at the Sofia Imber Caracas Contemporary Museum’s Biennial of Visual Arts, in Venezuela; the “Conferry Award”, First Sculpture Biennial, Francisco Narváez Contemporary Art Museum, Margarita Island, Venezuela; “Artist of the Year ’95”, Etiqueta Magazine, Caracas, Venezuela; Decoration by Carupano Township, in Sucre State, Venezuela. Throughout his career as an artist, Rafael Barrios has worked as Art Director for UNESCO; as Creative Consultant for “Latin Touch” cinematographic creations; as Stage Designer for Chris Von Wangenheim in Vogue and Esquire magazines, in New York, US. He was a Professor of Three-Dimensional and Advertising”, at the Neumann Design Foundation, in Caracas, Venezuela; Stage Designer for “DanzaHoy”‘s presentation in Expo-Sevilla, Spain; and Stage Designer for Hervé Leger in his “Carrouselle du Louvre” show, in Paris, France. Many of his pieces can be found in public spaces, such as the Murals at Fundación Polar, in Caracas; Art et Industry, New York; Coca-Cola International Headquarters in New York; Monumental Sculptures at Sofia Imber’s Caracas Museum of Contemporary Art; Banco Consolidado (now CorpBanca)’s Headquarters in Caracas; the Seguros Venezuela Building in Caracas; and Procter & Gamble’s Headquarters in Caracas. Rafael Barrios has shown in the United States, Europe, South America, and other Latin American countries, as well as in the Middle East. His work can be found in permanent collections in the Ontario Art Gallery and the Carmen Lammana Foundation in Toronto, Canada; also in the National Art Gallery in Caracas; the Sofia Imber’s Caracas Museum of Contemporary Art; as well as in the private collections of HRH Don Juan Carlos de Borbón, King of Spain (Levitating Simetry); and the collection of HRH Gloria, Princess of Germany. 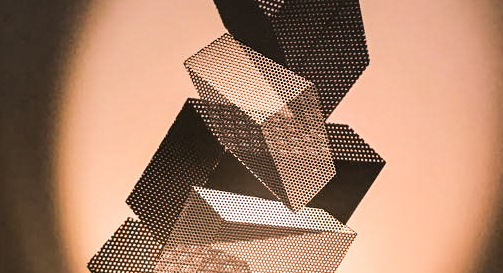 In 1973, renowned futurist Marshall McLuhan said in a lecture at the University of Toronto: “The work of Rafael Barrios is like fresh fruit for thought.” Rafael Barrios plays with shapes, altering the laws of geometry, fabling volume in space. 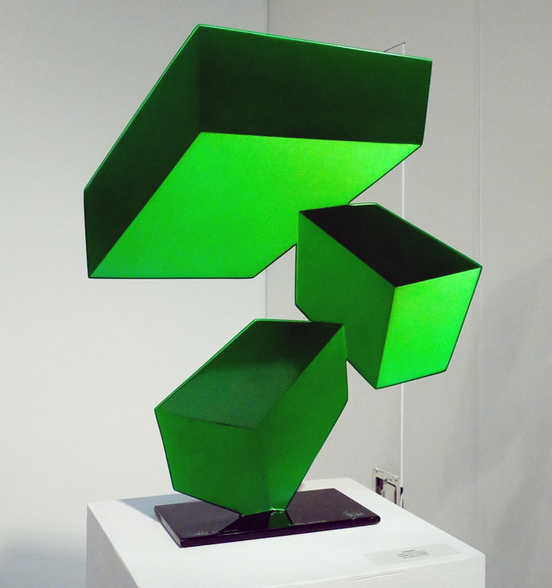 His sculptures are characterized by breaking orthodox directionality, accessing new possibilities of perception. Vertiginous elevations cause his virtual works to seemingly erect upon themselves, defying the laws of space, alleviating bodies that should be subject to gravity. Rafael Barrios’ works are identifiable by a set of dynamics, levity, strength, and magnetism, which is imprinted on each individual creation in order to reach the beholder’s spirit. “As long as we insist on proposing virtual reality as a simulation or a representation of universal identity, we are making the same academic mistake made when affirming that painting is destined to fixate a moment of reality, without realizing that not even photography, which is considered as the nearest invention that allows us to catch instantaneity, escapes the temporal value between the fixation of the stimulus, and the time of its preception. Let us remind ourselves of Heraclitus’ river, and Plato’s caverns: seemingly contradictory images, but both of which cause us to reflect upon the fact that we only gain knowledge of a reality through its projection. Today, we receive the light of stars that disappeared millions of years ago. Is that image not a part of our real world? Therefore, art shall be closer to the truth as long as its contents incorporate the virtual as a sublime fact. Rafael Barrios sculptures are original works, with its concave front, designed with the intention to be visually participatory and be appreciated in all its possibilities from any side, generating a metamorphic event, volumetric, chromatic, iridescent, always virtual that it modified in its forms and size; Depending on the distance, the direction of displacement of who contemplates it and by the subtle changes of light throughout the day.